Emeteria Cabuñag has been selling religious items near the Quiapo Church for more than 40 years. Every ninth of January, millions of Filipino Catholics flock to the heart of Manila to join or watch the Traslacion, a religious procession commemorating the transfer of life-sized statue of the Black Nazarene from Intramuros to Quiapo church in 1868. The yearly event puts parts of the city at a standstill as devotees of the blackened image of the cross-bearing Christ, expected to reach 18.9 million this year, try to press their handkerchiefs or towels on the image. Scores get hurt in the process but thousands still try, believing it would turn their most fervent wishes into reality. 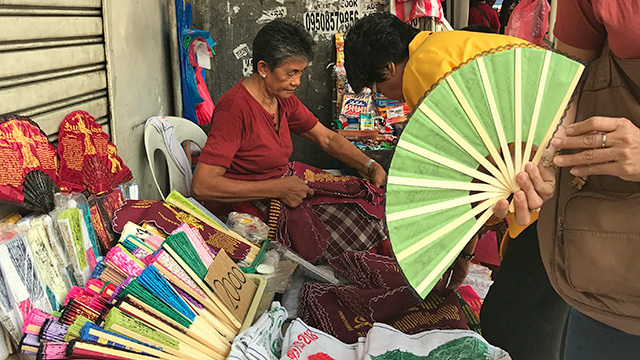 Bearing images of the Black Nazarene, the towels and handkerchiefs have also brought a lifetime of blessings for 67-year-old Emeteria Cabuñag, a long-time street vendor in Quiapo. Aling Terry, as she’s more commonly known, has been selling religious items that are popular with the legions of followers of the Catholic icon for more than 40 years. That helped her not only to make a daily living but even send her three children to college and set aside a modest amount as savings in the bank. With her children living on their own, she’s now busy helping send some of her grandchildren to school. “These days, I just make sure my earnings are enough for our daily expenses and for my grandchildren’s daily allowance in school. Thankfully, I also have saved enough in the bank,” Cabuñag said. At first glance, Cabuñag’s makeshift stall, located outside a bank branch beside the Quiapo church, doesn’t seem to be the kind of retail space to generate enough income to send three children to college. Not even two meters by one meter in size, it’s exposed to the elements with nothing but a big umbrella to protect her and her wares. Yet, by working at least 12 hours each day selling items priced at just Php20 to Php50 apiece, she manages to gross around Php3,000 a day, she says. However, like many micro-entrepreneurs, she doesn’t know exactly how much her net income is after deducting the cost of the goods she’s selling. She just says she makes enough to feed her family, send her children to school and save a little. "I would start at nine in the morning. But when it's the first Friday of the month, I'll be here by 5 a.m. because there will be a lot of people for sure. Then I would leave by nine in the evening,” the widowed Cabuñag told Entrepreneur Philippines, speaking in Tagalog. 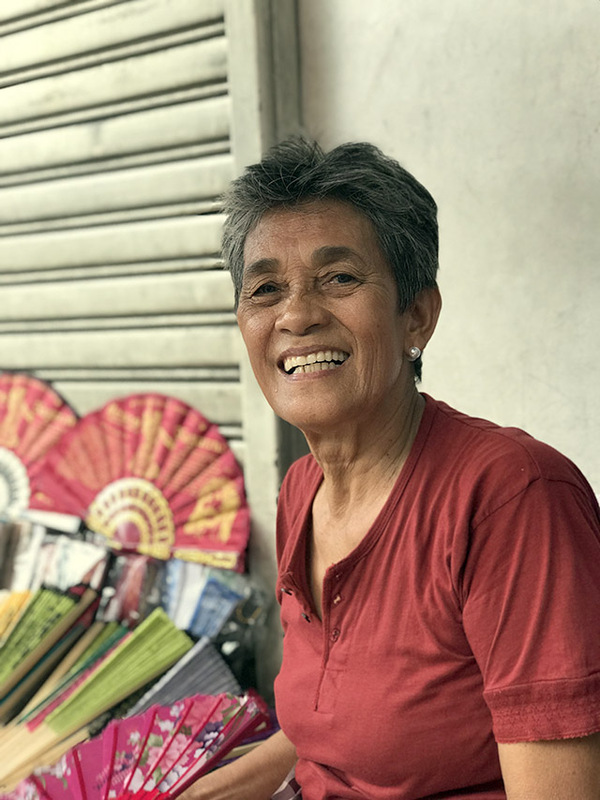 Cabuñag inherited her spot in Quiapo from her husband's parents when they could no longer attend to their stall due to old age. Since she got the spot, she never let it go. "My three kids were able to finish school just thanks to this stall. All of them are working now. One is a teacher, my second child is an office secretary while my youngest works in the airport," Cabuñag proudly shared. Aside from religious items, expanding fans are some of the best-selling items among Aling Terry's wares. Like other street vendors, Aling Terry is constantly exposed to the threat of eviction. When a pedestrian overpass was constructed near her stall, the Quiapo Church administration tried to forbid her from setting up her stall in its usual location because it impeded foot traffic. "I had to cry my way to the head priest just so I can continue selling here. Thankfully, he was kind enough to let me stay," she said. Other vendors who used to operate stalls just in front of the church weren’t as lucky. All of them had to go when the parish administration cleaned up the outdoor premises. Fortunately, Cabuñag’s location wasn’t directly in front of the church so she was spared. Days before the Traslacion, Cabuñag enjoys generous revenues, even triple or quadruple her usual daily sales. On good days, she can sell up to a thousand handkerchiefs. On top of that, she also sells a lot of expanding fans that churchgoers buy to cool themselves amid the heat. Apart from long hours, days when sales peak also demand a sizeable capital. "That's why when it's Feast Day or during Holy Week when crowds are thick, I would always make sure to have a huge capital so I can buy more goods. It also helps to always have products in stock so I can prepare for huge orders," she said. Yet, on January 9th, the day of the Traslacion itself, Cabuñag won’t be around at her stall. Instead, she’ll be at home hosting a modest get-together for relatives and family friends who come to visit for the festivities. “It’s been a family tradition that we don’t sell on this day. I consider it as a time off from work and also to honor the Black Nazarene,” she said. What makes the get-togethers particularly special is that Cabuñag’s home, an old wooden house that she’s been renting for a long time, is located along the procession’s route. Despite seeing the Traslacion for more than four decades, she still gets goose bumps borne out of unexplained fear every time she sees the image of the Black Nazarene passes by her house. “Kinikalibutan pa rin ako kahit hanggang ngayon,” she admits. Perhaps that explains her unusual vow to stop selling on January 9th itself and instead hold a get-together to share her blessings with friends and relatives. It’s her way of saying thanks to the Black Nazarene whose sacred image turns ordinary towels, handkerchiefs and fans into sellable items popular among the legions of the icon’s devotees.